Partnership offers the industry a comprehensive set of digital services for off-street and on-street parking. 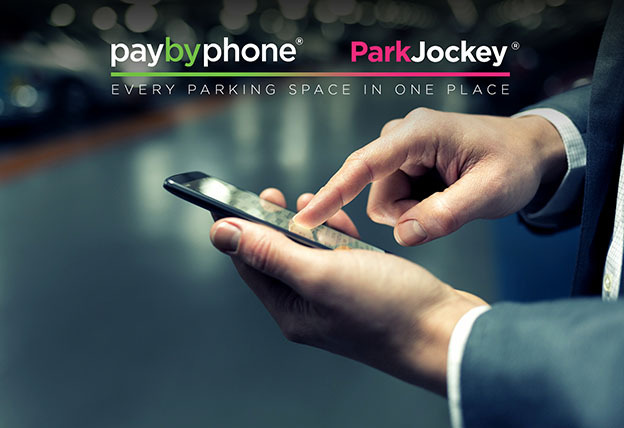 December 21, 2015 – Miami, FL and Vancouver, BC – PayByPhone, the world leader in mobile payments for parking has joined forces with parking location and reservations provider ParkJockey to deliver a comprehensive set of off-street and on-street parking services to parking authorities, parking operators and consumers. Through the partnership, PayByPhone will integrate ParkJockey’s off street parking location and reservation services into its paybyphone mobile app. In turn, ParkJockey will integrate PayByPhone mobile payment services into the ParkJockey app. The partnership will initially focus on the US, Canada and the UK and will expand globally accordingly. The two companies plan to introduce integrated services to their consumers in early 2016. Increase revenue: With the ability to get alerts and extend their time using a mobile app, PayByPhone’s mobile payment solution helps boost compliance which in turn boosts revenues through increased use of available inventory. Improve and optimize capacity utilization: Adjust pricing based on demand to maximize use of available inventory and associated revenues. Better operations & insights at a fraction of the cost. PayByPhone and ParkJockey offer cities, parking operators and building owners with an easier, faster and more cost effective way to manage parking. The two companies’ combined services enable parking providers to offer drivers with better services and greater convenience without having to install and maintain expensive smart meters or pay and display machines. Better insight for urban planning. With a comprehensive understanding of parking inventory through payment transaction data, urban planners can gain insights that help them improve parking conditions and locations, and better locate special purpose lanes for bicycles and public transit on city streets. PayByPhone is one of the fastest growing mobile payments companies in the world processing more than four million parking, tolling, public transit, bike share and EV charging transactions a month in cities across Europe and North America. Through the company’s mobile web, smartphone and smartwatch applications, PayByPhone helps millions of consumers easily and securely pay for parking and other transportation services without the hassles of waiting in line, having to carry change or risking costly fines. By helping transportation agencies and parking operators tap into the latest advancements in secure mobile payment, Big Data and location technologies, the company helps them reduce infrastructures costs while increasing revenue and compliance through the delivery of services integrated with consumers’ always on the go, mobile digital lifestyle. To learn more, visit us www.paybyphone.com or download our app for iOS, Android and Blackberry devices. ParkJockey is a rapidly growing technology start-up with a focus on helping drivers get the best parking spaces in the off-street market via reservations or on-the-spot payments. With over 100,000 parking spaces under management, ParkJockey is currently operating in Miami, Chicago, New York, San Francisco and all major cities in the UK. To learn more, visit www.parkjockey.com or download ParkJockey app for your iOS and Android device. (1)Donald Shoup, The High Cost of Free Parking, Chicago: Planners Press, 2005 and 2011. (3) Frost & Sullivan, 2015,Analysis of parking in London, Berlin, Paris, New York, Chicago, San Francisco, Amsterdam, Washington D.C.
Click here to download the full Press Release in PDF. This entry was posted in Chicago, London, Miami, New York, News, ParkJockey, Press, San Francisco and tagged apps, best new apps, Canada, Igal Aciman, Jim Bak, Kush Parikh, parking, parking reservations, parkjockey, Partnership, PayByPhone, PayPoint, press release, San Francisco, smart parking, technology, UK, Umut Tekin, USA on December 21, 2015 by ParkJockey Team. Our Global Head of Marketing, Igal Aciman, took the stage as one of guest speakers at Nimbus Ninety’s annual IGNITE conference at The Worx, London. As a technology-focused business association, Nimbus Ninety brings together over 400 business leaders over two days of keynote speeches, breakout sessions, networking events and an awards ceremony. The great line-up of speakers besides Igal included business leaders from Tesla Motors, Virgin, BBC Worldwide, and many others. Igal’s breakout session talk was titled “Customer-centric digital disruption in a traditional industry,” in which he elaborated on the lessons from ParkJockey’s experience with digital disruption that are applicable to large companies. Check out the full recording below! In addition to the talk, you can also review the case study on ParkJockey that Nimbus Ninety published on October 10, featuring an interview with Igal Aciman and our Head of Operations – UK, Kamal Rajput. This entry was posted in London, News, ParkJockey, PlumValet, Press and tagged BBC, digital, disruption, Igal Aciman, IgniteAwards2014, Kamal Rajput, London, NimbusNinety, Tesla, video, Virgin on November 19, 2014 by ParkJockey Team. 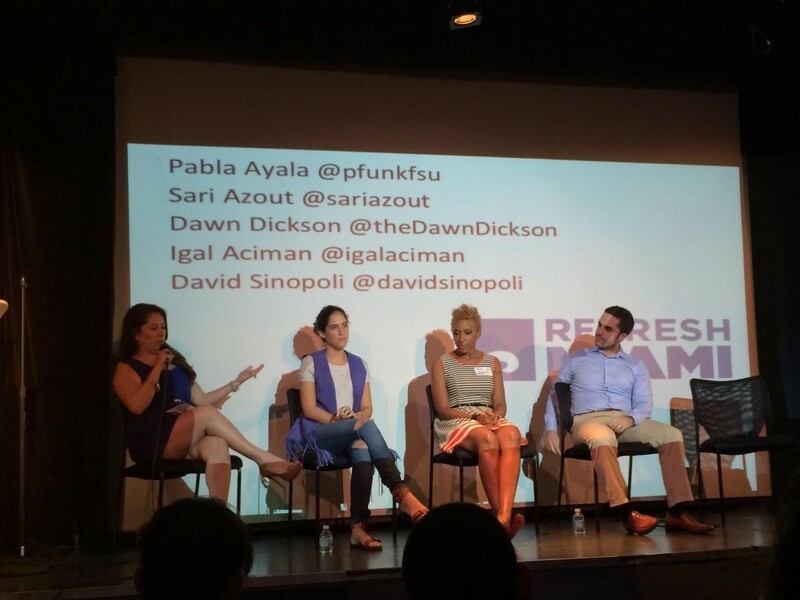 Last Thursday, Igal Aciman, our Global Head of Sales & Marketing, was a guest speaker on Refresh Miami’s “You’ve Built It, Now Launch It!” panel. Other panelists included Sari Azout, Co-Founder of Bib and Tuck, an online portal to sell clothes and shop a curated collection of personal closets, and Dawn Dickson, CEO and Founder of Flat Out of Heels, a rollable flat that promises to ease the pain of women across the world. The panelists highlighted ways to grow your customer base, garner press and track success. Refresh Miami began in April of 2006 and has grown to become the largest technology networking organization in South Florida. Their goal is to provide the community with a steady stream of educational content focused on the technological and entrepreneurial communities. Their events are held once a month in various locations around Miami. For more information, click here. This entry was posted in Miami, News, ParkJockey and tagged Igal Aciman, parkjockey, Refresh Miami, Tech on July 28, 2014 by ParkJockey Team. As the city prepares to kickoff eMerge Americas Techweek, the Miami Herald took the time to highlight a few startups that have chosen to call Miami home. ParkJockey is showcased, along with game creator Shiver Entertainment, mobile-banking provider Yellow Pepper and a few others. All have relocated their business to the area based on quality-of-life, geographic position, diversity, or cost of living. If you’re planning to attend Techweek, make sure to catch our co-founder and CEO, Umut Tekin, speaking on the Big City Mobility panel on Tuesday! This entry was posted in Chicago, Miami, News, ParkJockey, Press and tagged app, Driving, emerge americas, Igal Aciman, Miami, Miami Herald, parking, parkjockey, Scott Rosen, techweek, Umut Tekin on April 29, 2014 by Maria Perez.